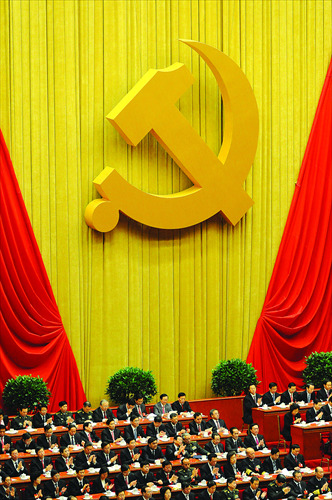 More than a month has passed since the annual policy-setting meeting of the Communist Party of China (CPC) in late October. Yet the ruling party's decision to "comprehensively advance the rule of law" remains a talking point among political analysts, as it is expected to become the cornerstone of the modernization of China's State governance and national rejuvenation. The new Party leadership, led by Xi Jinping, has launched an unprecedented anti-corruption campaign over the past two years in a bid to purify the ruling party and win back the people's confidence. More than 50 senior officials at or above the vice provincial or ministerial level have since been removed, including Zhou Yongkang, a former Standing Committee member of the Political Bureau of the CPC Central Committee, and Xu Caihou, a former vice chairman of China's Central Military Commission. The decision to advance the rule of law, released at the end of the fourth plenary session of the 18th CPC Central Committee, is widely seen as a further step to systemically limit the power of officials, or in Xi's words, to "put power in the cage of regulations." Besides upholding the authority of the Constitution, a significant part of the 170,000-word document was devoted to checking government power and ensuring greater judicial independence. To promote public awareness of the Constitution, the Party set December 4 as "Constitution Day." The paper also stipulates that "No organization or individual shall have the privilege of being placed above the Constitution. All activities that violate the Constitution must be dealt with and rectified." Law experts have long been calling for the establishment of a special committee to supervise the implementation of the Constitution, arguing that the Constitution will become meaningless if individuals or organizations that violate the Constitution are not held responsible. Some analysts expressed their optimism because the latest decision states that "the National People's Congress supervises the implementation of the Constitution." Although the paper stresses the Party's leading role in the country's pursuit of the rule of law, when it comes to the role of the Political and Legal Affairs Commission (PLAC) of the CPC, a Party organ overseeing national and local legal affairs, the paper made it clear that the commission should focus on ensuring that judicial workers do their job according to the law and create a fair environment. Analysts said the new stipulation means that PLAC officials, who often give orders to local courts, are now forbidden from influence peddling, as they are only supposed to ensure the political correctness of judicial work on a macro level. To make sure the courts can do their job independently, the paper said a system will be set up to record, report and hold responsible government leaders who interfere in court cases. If the interference results in a miscarriage of justice or other serious consequences, the officials will be held criminally responsible, the paper said. Government agencies are also required to list their functions to clearly define their authority. This will largely squeeze the margin for some officials who use their power for illegal gains. Obstacles are inevitable in the new reforms, just like the stubborn resistance to the Party's ongoing anti-corruption campaign. After all, the public has been showing increased confidence in the Party leadership's determination to rebuild the ranks of the ruling party and lead the country to modernity.